M5 Worcestershire - One lane blocked and slow traffic on M5 northbound between J5, A38 (Droitwich) and J4a M42, because of a broken down vehicle. M5 West Midlands southbound severe disruption, between J3 for A456 Halesowen and J4 for A38 Bromsgrove. M5 West Midlands - One lane closed on M5 southbound between J3, A456 (Halesowen) and J4, A38 (Bromsgrove), because of debris on the road. Traffic is coping well. M5 Worcestershire southbound severe accident, between J7 for A44 Worcester and J8 for M50. M5 Worcestershire - One lane blocked on M5 southbound between J7, A44 (Worcester) and J8 M50, because of an accident. Traffic is coping well. Six men and two women died in a crash involving two lorries and a minibus near Newport Pagnell. A former Mayor of Worcester has lost his wife, following a crash on the A458 near Much Wenlock yesterday afternoon. Aubrey Tarbuck said 88-year-old Anne was taken to the Royal Stoke University Hospital, but died of her injuries. He described her as a "wonderful woman" and said "I thought the world of her and would do anything for her". Mr Tarbuck is receiving treatment for four broken ribs at the Royal Shrewsbury Hospital. A man and his daughter in another car were flown to hospital. The young girl had head and chest injuries and the man suffered minor cuts and bruises. The Tour of Britain brought an extra £500,000 into the Worcester economy, when a stage of the race passed through the town last month, the city council has said. The local authority believes it generated extra spending in hotels, shops, cafes and restaurants. The event organisers have said 800,000 people tuned into TV coverage of the Worcester stage start, when it was broadcast live on ITV4. A statue of former Prime Minister Stanley Baldwin should be erected in Bewdley in the new year. The town's civic society has raised £100,000 to get it made and had been hoping to have it put up this year. Mr Baldwin was born in the town and was MP for the area for 30 years. The society is hoping the current prime minister will be able to officially unveil the statue, when it's complete. It says another £20-30,000 is still needed to complete the groundworks. 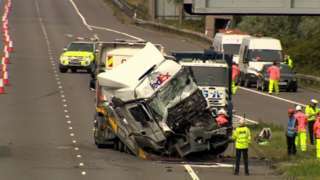 Two lorry drivers charged over a crash on the M1 that left eight people dead are both from the West Midlands. Ryszard Masierak, 31, of Evesham, Worcestershire, and David Wagstaff, 53, of Stoke-on-Trent, each deny eight counts of causing death by dangerous driving. The crash involving two lorries and a minibus happened on the southbound carriageway of the M1, near junction 14, on 26 August. A trial has been set for 26 February at Aylesbury Crown Court. Mr Masierak was remanded in custody, while Mr Wagstaff was given bail. M42 Worcestershire northbound severe disruption, between J2 for A441 Alvechurch and J3 for A435 Portway. M42 Worcestershire - One lane closed and heavy traffic on M42 northbound between J2, A441 (Alvechurch) and J3, A435 (Portway), because of a lorry having a tyre changed. An independent investigation has found that a cyber attack that crippled parts of the NHS in May could have been prevented if "basic IT security measures" had been in place. Several hospitals, community health trusts and GPs across the West Midlands were affected - some particularly badly. The National Audit Office said the health service was not prepared for the Wannacry attack, in which criminals froze NHS computers and demanded a ransom - no trusts are thought to have paid. Professor Keith McNeil, from NHS England, said some local health providers across the country hadn't followed the national procedure. An assessment of 88 out of 236 English trusts by NHS Digital before the attack found that none passed the required cyber-security standards. A survey of business leaders in the West Midlands has revealed that more feel "negative" about Brexit than "positive". Research by BBC Sunday Politics West Midlands asked 700 firms how the UK's decision to leave the European Union had impacted upon their trade. One in four companies said the referendum result had harmed their business, while one in 10 said it had improved their commercial outlook. Any early mist and fog will clear through the morning. It will be staying dry and bright through the rest of the day, with plenty of sunshine around and light winds - highs of 15C (59F). M5 Worcestershire - One lane closed on M5 southbound between J4a M42 and J5, A38 (Droitwich), because of a broken down vehicle. M5 Worcestershire - One lane closed and slow traffic on M5 northbound between J5, A38 (Droitwich) and J4a M42, because of a broken down vehicle. In the roadworks area.